In order to further productivity and competitiveness the Minstry of Economy works to achieve sustained economic growth and accelerate job creation. In addition, the Ministry recognizes that scientific development and technological innovation are an important source of economic growth and strives to streamline the processes involved in research to increase the economy's productivity. In this context, the Undersecretariat of Trade and Industry promotes and enhances sustainable economic development, innovation and competence within a global environment. Some of the strategies used are: tariff reduction, automation and reduction of trade procedures and the design and implementation of programs which drive production and innovation. Current global economic conditions of market integration, high trade volumes and high competitiveness provide windows of opportunity to promote and support productive sectors as part of a national strategy. The country's economic diversity implies that a wide array of productive sectors must be considered to achieve balanced national development. This section provides information from productive sectors on their contribution to the national economy and some of the lines of action the Secretariat of Economy has implemented for its development. Industrial policy is the set of actions aimed at resolving market distortions; i.e., when free market allocations of goods and services in the economy are not efficient. Among these market distortions are externalities, monopolies or oligopolies, incomplete markets, asymmetric information and coordination of agents. Similarly, industrial policy actions are conducive to collaboration between the private sector and government to develop those sectors that have a greater impact on economic growth. Industrial policy seeks more balanced regional growth by exploiting comparative advantages and leveraging knowledge spills and scale economies to further economic development. The objectives of industrial policy focus on providing information to economic agents; implementing specific actions and instruments for the promotion of human capital and financing and, coordinating, targeting and prioritizing joint actions between the private sector and different levels of government. 1. To strengthen and develop the domestic market with the same robustness as the foreign market. 2. To strengthen nascent industries which have competitive advantages. 3. To enhance innovation, the promotion of human capital and technology exchange among industries. 4. To provide information to agents to resolve market distortions, particularly asymmetric information and coordination of agents. 5. To coordinate, target and prioritize joint actions between the private sector and different levels of government. A program has been developed to gradually reduce the tariffs over a five-year term, of more than 10,000 sections related to industrial products and to extend the benefits of sectoral programs which, in today's environment, is only possible by reducing tariffs to levels similar to those of our principal partner. This measure eliminates incentives for triangulation and for the generation of technical contraband, furthering the creation of a North American customs zone. The measure eliminates a complex tariff structure that caused legal uncertainty to the detriment of free competition and unrestricted access for small and medium-sized businesses, which resulted in an administrative burden for the State. This provides for the simplification and streamlining of customs clearance procedures; the revision of standards and their transition towards approval into the international or US standard, and the acceptance of conformity certification issued by certain approved, international certification agencies; the review of violations and penalties; the facilitation of entry and reintegration to the register of importers and the simplification of the authorization procedure for attorneys. The transparency and institutionalization of changes and their outcomes are critical factors. Mexico has created the Foreign Trade Regulatory Commission (COCEX), which major capabilities are: a collective technical body involving several federal agencies, Banxico and CFC; and, the legal power to comment on the implementation of tariff and non-tariff trade regulations. Given the fierce competition for global markets, Mexican businesses must at least have the same conditions offered by our major competitors, to enable them to successfully position their goods and services in the international trade arena. To that end, on November 1, 2006, the Federal Government published the Decree for the Promotion of the Manufacturing, Maquila and Export Services Industry (IMMEX Decree), aimed at strengthening the competitiveness of the Mexican export sector, and granting certainty, transparency and continuity to business operations by identifying and simplifying compliance factors, allowing them to adopt new ways to operate and do business; reduce logistics and administrative costs; and modernize, streamline and reduce processes in order to raise oversight capacity in an environment which encourages the capture and retention of investment. This instrument includes the programs for the Development and Operation of the Maquila Export Industry and that which establishes Temporary Import Programs to Produce Export Goods (PITEX), whose companies jointly represent 85% of Mexico's manufactured exports. The Single Window is a tool which allows the sending of electronic information to a single entity, only once and in order to meet all foreign trade requirements. This is possible through the simplification, standardization and automation of the management processes. In practical terms, the Single Window aims to streamline and simplify the information flows between trade and government and provide significant benefits to all parties involved in cross-border trade. Usually, the Single Window is managed centrally, by a governing body allowing both the competent authorities and government agencies to receive or get access to relevant information. Furthermore, the participating authorities and agencies must coordinate their controls. In some cases, the Single Window must supply the means to pay relevant rights, taxes and fees. Since the 90s, the worldwide trade has grown twice as quickly as the world Gross Domestic Product. Countries able to attract the foreign investment and boost the foreign trade will have a greater economic growth. However, increasing the trade exchange between countries and reducing or eliminating tariffs is not enough; customs modernization systems must be introduced to reduce costs and increase international competitiveness. Countries with better foreign trade practices have adopted the Single Window (Ventanilla Única, in Spanish). Nowadays, the foreign trade in Mexico involves a large number of procedures, paperwork and people. Around 30 players are involved among government offices, exporters, importers, transporters and customs workers; this represents 40 documents, 165 procedures and 200 different data items, many of which must be filed several times. Modernization programs, customs reforms and trade facilitation are all necessary if countries wish to reduce trade transaction costs and increase international competitiveness. The International Trade Practices Unit (UPCI) of the Ministry of Economy is the Mexican Government's administrative unit responsible for investigating unfair international trade and safe harbor practices. The UPCI participates internationally in the defense of rulings issued by the Ministry of Economy and provides assistance to Mexican exporters affected by investigations conducted by foreign governments. e) To act as a technical reference unit for the Ministry of Economy and other Mexican government agencies on matters within their competence and international trade negotiations. For more than 40 years, the Manufacturing Industry in Mexico has received constant attention from the Federal Government in order to encourage its development. Several factors have contributed to the development and growth of the Export Manufacturing Industry in Mexico, particularly the Federal Government's support of activities by providing incentives to defer the payment of general import tax, value added tax and, where appropriate, countervailing duties on raw materials, machinery and equipment for their operations. There are no sectoral restrictions on performance, they are 100% open to foreign capital and can set up and operate in any part of the Mexican Republic. Furthermore, the administrative simplification process made possible by the SICEX-Maquila computer system has made the manufacturing industry's procedures much easier. The development and operational policies implemented by the Mexican government have turned the manufacturing industry into the most dynamic factor in national industry in recent years. Given the fierce competition for global markets, it is vital for Mexican businesses to have, at least, the same conditions offered by our main competitors, to allow them to successfully position their goods and services in the international trade arena. With this purpose, on 1 November, 2006 the Federal Government published the Decree for the Promotion of the Manufacturing, Maquila and Export Services Industry (The IMMEX Decree), aimed at increasing the competitiveness of the Mexican export sector, and bringing certainty, transparency and continuity to companies' operations, specifying and simplifying the compliance factors; allowing companies to adopt new ways of operating and doing businesses; reducing its logistics and administrative costs; and modernizing, streamlining and reducing procedures, with the purpose of increasing the capacity of audit in an environment which encourages the capture and retention of investments in the country. This instrument integrates the programs for the Development and Operation of the Maquiladora Industry of Export and the program that establishes The Temporary Import Programs to Produce Goods for Export (PITEX), whose companies represent jointly 85% of Mexico's manufactured exports. The IMMEX Program is an instrument which allows the temporary importation of goods that are used in an industrial or service process intended to produce, transform or repair foreign goods imported temporarily for its subsequent export or the provision of export services, without covering the payment of the general tax for import, the value added tax and, where appropriate, the countervailing duties. The Secretariat of Economy (SE) shall authorize the legal entities resident in national territory referred in the Fraction II of the Article 9 of the Fiscal Code of the Federation, which are taxed according to Title II of the Income Tax Law, one only IMMEX program, which can include the following categories: holding, industrial, services, shelter and outsourcing companies, providing they meet the requirements set forth in the Decree for the Promotion of the Manufacturing, Maquila and Export Services Industry (IMMEX Decree) published in the Official Gazette of the Federation on 1 November, 2006. 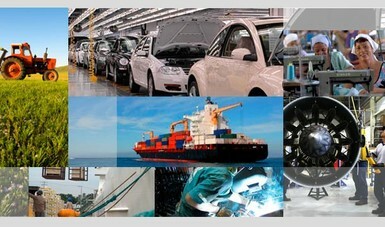 The IMMEX program provides holders the possibility to import, temporarily free of import tax and the Value Added Tax, the goods necessary to be used in an industrial process or service to produce, oriented to transform or repair foreign goods temporarily imported for its subsequent export or the provision of export services. 1. Raw materials, parts and components which are to be totally integrated into export goods; fuels, lubricants and other materials for consumption during the production process of export goods; containers and packaging; labeling and leaflets. 2. Shipping containers and boxes. 3. Machinery, equipment, tools, instruments, molds and spare parts for the production process; equipment and devices for contamination control, research or training, industrial security, telecommunications and computing, laboratory, measurement, product testing and quality control; and those involved in handling materials directly related to export goods and others linked to the production process; and administrative development equipment. Simultaneously, the Secretariat of Economy may approve a Sectoral Promotion Program based on the type of products manufactured or the export services made, in which case the applicable regulations must be followed. In the case of a service company, only goods referred to in Article 4, Fraction III of this Decree, may be imported under the Sectorial Promotion Program, whenever they belong to the sector in which it is registered. The IMMEX Programs will remain valid while the holder continues to meet the requirements for authorization and the obligations established in the Decree. Those goods imported temporarily under an IMMEX program may remain in national territory for the established terms in Article 108 of the Customs Law. When goods mentioned in Annexes II and III of the IMMEX Decree are imported as raw materials, the length of permanence shall be up to twelve months. In the case of goods included in Annex III of the IMMEX Decree, when they are imported as raw materials, and only when they are destined for activities classified as services, the length of permanence will be up to six months. The goods mentioned in Annex I of the IMMEX Decree may not be imported under the Program. In order to enjoy the benefits of an IMMEX program the terms established in the Decree must be fulfilled. The authorization of the Program will be granted under the commitment to have annual sales abroad of at least US $500,000 or an equivalent sum in Mexican pesos, or invoice exports accounting for at least 10% of its total invoices. The holder of an IMMEX program must submit an annual electronic report of total sales and exports for the immediately preceding tax year, no later than the last business day of May, according to the form announced by the Secretariat of Economy through the General Rules and Criteria on Foreign Trade. In addition, the company with an IMMEX program shall submit the information that, for statistical purposes, is determined under the terms established by the Secretariat of Economy in the General Rules and Criteria on Foreign Trade. For more information about the program please call 01 800 410 2000 throughout the country or at the Citizen Contact Center of the Secretariat of Economy via mailbox at http://www.gob.mx/se/acciones-y-programas/atencion-ciudadana-centro-de-contacto-ciudadano; or contact Sergio Manríquez Fernández, Underdirector of Tax Refunds at 52-29-61-00, ext. 34347. All procedures relating to the IMMEX Program are free and can be done at the public service windows of the federal agencies of the Secretariat of Economy corresponding to the address of the plant where the production process or service is carried out. 1. Certificate of Advanced Electronic Signature from the SAT. 2. Active Federal Taxpayers Registration. 3. The registered address and premises where the operations are carried out under the Program must be registered and active in the Federal Taxpayers Register. 1. Certified copy of the company's Articles of Incorporation and, where appropriate, its amendments. 2. Copy of the document legally certifying the possession of the property where the IMMEX program operation is intended to take place, specifying its location and attaching photographs of the property. If the property is leased or loaned, it must be proved that the contract establishes a mandatory period of no less than one year and that a minimum of eleven months remains of that period, on the date the application is filed. 3. Maquila contract, purchase contract, purchase orders or confirmed orders, which prove the existence of the export project. 4. Corresponding Power of Attorney (original or certified copy and single copy); or exhibit a copy of the Central Register of Accredited Persons (Registro Único de Personas Acreditadas or RUPA, by its acronym in Spanish). 5. Free format letter detailing the production process or services referred to in the program application. 6. In the case of goods referred to in Article 4, Fraction I of the Decree for the Promotion of the Manufacturing, Maquila and Export Service Industry** (IMMEX Decree), a letter detailing the production process or service which includes the installed capacity of the plant to process the imported goods or perform the service covered by the program and the percentage of that capacity actually used. 7. Letter of conformity from the company or companies which perform the sub-manufacturing process stating under oath the joint liability for the temporarily imported goods (original). - Minutes of the shareholders meetings, stating the shareholding of the holding company and subsidiaries (original and copy). - The certified entries in the shareholders register (copy). - The Authorization as a certified company (copy), given by the Secretariat of Finance and Public Credit. - Letter of conformity from the company or companies which will perform the outsourcing, stating under oath the joint liability for the temporarily imported goods (original). - Company or companies requesting the Outsourcing program must be approved by the Secretariat of Finance and Public Credit as a certified company. The number of workers of the company holding the IMMEX program and, where appropriate, of each of the companies which perform sub-manufacturing activities. II.- Free-form Letter from the legal representative of the company stating the projected exports in dollars for the six months following the start of operations. The IMMEX.EXE program can be obtained from the following Internet address: http://www.gob.mx/se/ or directly from the public service windows, presenting four high-density magnetic discs or a CD. Fill out the application in the IMMEX.EXE program and submit it on magnetic disc or CD, with two duly completed, printed copies. 7. The number of workers of the company holding the IMMEX program and, where appropriate, of each of the companies which perform sub-manufacturing activities. 8. Free-form Letter from the legal representative of the company stating the projected exports in dollars for the six months following the start of operations. 9. The extension of the IMMEX program for sensitive products. Companies seeking an extension to import goods included in the Tariff headings in the General Import and Export Duties Law, which are mentioned in Annex II of the IMMEX Decree, must attach the following documentation to the application. 1. Tariff heading and unit of measurement, according to the Tariff. 2. Maximum import volume for the year and its value in dollars. Description: as it should be provided on the export declaration. The description should relate to the commercial description on the invoice and the tariff heading and unit of measurement, according to the tariff. 5. For goods listed in Annex II, Fraction I of the IMMEX Decree, documentation must also be submitted proving that the petitioner is within the Federal Inspection System Type (Sistema Tipo de Inspección Federal or TIF), its refrigeration capacity and, where appropriate, its freezing capacity, and the document proving the petitioner has the import authorization issued by the country to which the transformed product will be exported. I. Free-form Letter specifying details of the goods to be imported: tariff heading and unit of measurement, in accordance with the tariff, and maximum import volume for the year and its value in dollars. - Volume of imported goods under the previous authorization of the goods covered in Annex II of the IMMEX Decree. - Volume of products manufactured with the imported goods referred to in the previous item, specifying the number and date of the return declarations. - Volume of shrinkage and waste relating to industrial processes. - Amount of each material, in terms of the unit of measurement in accordance with the tariff, used in the production processes, indicating the shrinkage percentage. Extension of IMMEX program for the registration of service activities. No additional documentation is required with the application. 2. Extension of their own installed capacity or, where appropriate, of each of the companies performing sub-manufacturing activities. II.- Companies referred to in Fraction II of rule 3.4.8 should specify the percentage of additional use of the idle installed capacity or of extension of installed capacity for the next six months. 1. Letter of joint and several liability of the company which performs the industrial processes or services directly related to the manufacturing operation of the company holding the IMMEX program (original and copy). 2. Evidence of registration with tax identification card or evidence of registration to the Federal Taxpayers Register corresponding to the entity which will perform the sub-manufacturing operation (original and copy). 8. Holding companies, specifying the name, the Federal Taxpayers Registration and the address of the subsidiary companies. 1. Copy of the document legally certifying possession of the premises where the operation under the Program is intended to take place, specifying the location and attaching photographs of the premises, when this information differs from the information originally provided (original and copy). 2. Maquila contract, purchase contract, purchase orders or confirmed orders, which prove the existence of the export project, in relation to the new category (original and copy). 3. Free-form Letter explaining the production process or services to which the program application refers (original and copy). 4. In the case of goods referred to in Article 4, Fraction I of the Decree for the Promotion of the Manufacturing, Maquila and Export Service Industry, a letter describing in detail the production process or service which includes the installed capacity of the plant for processing the goods to be imported or to perform the service in question and the percentage of this capacity actually used, when this information differs from the information originally provided (original and copy). 1. Minutes of shareholders meetings proving the shareholding of the holding company and the subsidiaries (original and copy). 3. The maquila contracts that each subsidiary has with the holding company or a maquila contract in which the contracted obligations are established for the holding company and for the subsidiaries in relation to the objectives of the requested program, duly notarized (original and copy). 4. The authorization as a certified company (original and copy) granted by the Secretariat of Finance and Public Credit. To request the change to the Outsourcing category, in addition to the requirements for Industrial, Shelter or Services, the following documents must be presented: Letter of compliance from the company or companies which will carry out the outsourcing process containing a sworn statement accepting joint and several liability for the temporarily imported goods (original and copy). 1. Register of the companies to which the services will be provided: free-form Letter making the petition including the following information on the companies to which the services will be provided, such as: company or business name, Federal Taxpayers Registration number, full address of the plant and IMMEX registration number. Additional documentation is not required. a) Minutes of shareholders meetings containing the shareholding of the holding company and the subsidiaries (original and copy). b) Contracts held by each subsidiary with the holding company or a contract which establishes the obligations contracted by the holding company and the subsidiaries in relation to the objectives of the program, duly notarized (original and copy). a) Letter of compliance from the company which will perform the outsourcing containing a sworn statement accepting joint and several liability for the temporarily imported goods (original and copy). 4. Change, addition or removal of registered addresses and plants: free-form Letter making the petition, notifying the change, addition or removal of registered address or plants, specifying the full address. Suspension of the Program. If activities are suspended, a temporary suspension of the benefits granted by the IMMEX program should also be requested by submitting a free-form letter expressing and explaining the reasons for the suspension (original and copy). Cancellation of the Program. If it is taken a decision to cancel the IMMEX program, a free-form letter should be submitted to that effect (original and copy). Annual Report of Foreign Trade Operations. Only available through the website of the Secretariat of Economy: http://www.gob.mx/se/, annual report. This procedure is for notification purposes only and does not generate a response from the Secretariat of Economy. Inventory Control. The holder of the program should keep an automated inventory with the minimum information referred to in Annex IV of the IMMEX Decree. 1. Decree for the Promotion of the Manufacturing, Maquila and Export Services Industry, published in the Official Gazette of the Federation on November 1st, 2006. 3. General Rules on Foreign Trade Matters. 4. Federal Law on Administrative Procedure. 5. Foreign Trade Law and its Regulations. 6. Internal Regulations of the Secretariat of Economy. 7. Agreement through which the Secretariat of Economy issues General Rules and Criteria on Foreign Trade, and their amendments. 8. Agreement which establishes the procedures entered in the Federal Register of Business Procedures which apply to the Secretariat of Economy and its Coordinated Sector. 9. Agreement amending the miscellaneous provisions which approve the forms to be used for procedures before the Secretariat of Economy, the National Metrology Center, the Mineral Resource Council, the Mining Development Trust and the Federal Consumer Protection Agency and their reforms. 10. Agreement which establishes the procedures entered in the Federal Register of Procedures and Services which apply to the Secretariat of Economy and the decentralized agencies and regional offices of the sector. 11. North American Free Trade Agreement. 12. Ruling which establishes the general rules related to the application of customs-related provisions of the North American Free Trade Agreement and their reforms. a) The formula established in Article 303 of the NAFTA shall apply to inputs which do not originate from North America and are incorporated to a good which will be exported to the United States or Canada. In accordance with the formula, only the lowest tariff amount can be exempted, which results from comparing the tariff amounts of the inputs imported to Mexico and the tariff amounts paid in the United States or Canada for the finished product. b) Article 304 of NAFTA prohibits member countries of the free trade zone from granting import tax exemptions to machinery and equipment subject to export. Consequently, companies holding the IMMEX program must pay the import tax for the mentioned products. Tariffs on inputs, parts, components, machinery and equipment imported to Mexico can be calculated based on rates established in the free trade agreements and trade agreements signed by Mexico, like MEFTA, Sectorial Promotion Programs and the 8th Rule, providing the relevant authorization has been given. The Secretariat of Economy will determine those products (sensitive products) which cannot be imported under an IMMEX program or which need to meet specific requirements in order to do so. Companies must adhere to the provisions established in the Agreement through which the Secretariat of Economy issues the General Rules and Criteria on Foreign Trade Matters. Goods which cannot be imported under an IMMEX program are those included in tariff headings of the General Import and Export Duties Law (TIGIE), indicated in Annex I of the IMMEX Decree. Goods subject to requirements are those included in the tariff headings of the TIGIE, indicated in Annex II of the IMMEX Decree. 4. The products it manufactures. III. For goods listed in Annex II, Fraction I of the IMMEX Decree, documentation should also be submitted which proves that the petitioner is within the Federal Inspection System Type (TIF), its refrigeration capacity and, where appropriate, its freezing capacity, and the document proving the petitioner has the import authorization issued by the country to which the transformed product will be exported. III. The maximum amount in the unit of measurement according to the TIGIE which can be imported. The SE will respond within 10 working days following the submission of the application. 2. Maximum volume to be imported for the year and its value in dollars. 4. Amount of each material, in terms of the unit of measurement according to the TIGIE, used in the production processes, indicating the percentage of shrinkage. III. The volume actually imported, when not all the previously authorized consigned volume has been exercised and its duration has expired. The maximum duration of authorizations shall be twelve months. The maximum amount that the Secretariat of Economy will authorize for import will be an amount equal to twelve months' installed production capacity, according to the public accountant's report submitted by the company. The duration of authorizations for extension and subsequent extension to import goods under the IMMEX program which are included in Annex II of the IMMEX Decree will be twelve months. Pursuant to Rule 3.4.7 of the Agreement, companies with an IMMEX program which export their production in its entirety are excepted from compliance with the specific requirements for the temporary import of sensitive products. In addition, they may qualify for this benefit only when they have operated under these conditions for one year. Sectoral Promotion Programs (Prosec) are aimed at legal entities that produce certain goods, allowing them to import diverse goods for use in the development of specific products at preferential ad-valorem tariffs (General Import Tax), regardless of whether the goods to be produced are for export or the domestic market. The beneficiaries of Prosec are legal entities that manufacture goods referred to in Article 4 of the Prosec Decree, employing the goods mentioned in Article 5 of that Decree. Legal entities that manufacture goods referred to in Article 4 of the Prosec Decree may import, at the preferential ad-valorem tariff specified in Article 5 of that Decree, diverse goods to be incorporated and used in the productive process of specified goods. Benefits of the program only apply to import goods contained in the relevant sector: a good contained in one sector cannot be imported for the production of a good in another sector. Holders of Prosec programs may request their incorporation into new sectors, as long as they produce evidence of the production of goods in the new sectors. The legal entity which manufactures the goods to which Article 4 of the Decree refers, starting with, among others, the goods mentioned in Article 5 of that Decree, according to the sector. The duration of the programs shall be one year and shall be renewed automatically when the producers submit the annual report of the operations performed under the program, to which Article 8 of the Prosec Decree refers. When goods are imported under an additional IMMEX program, they may remain in national territory for the periods established in Article 108 of the Customs Law. When the import is made under a definitive import regime, the goods can remain indefinitely. In both cases, the holder of a Prosec program must use the imported goods for the manufacture of goods included in the sectors that have been authorized. In order to be able to benefit from a PROSEC Program, the terms set forth in the relevant Decree and the official communication containing the program's authorization must be complied with. 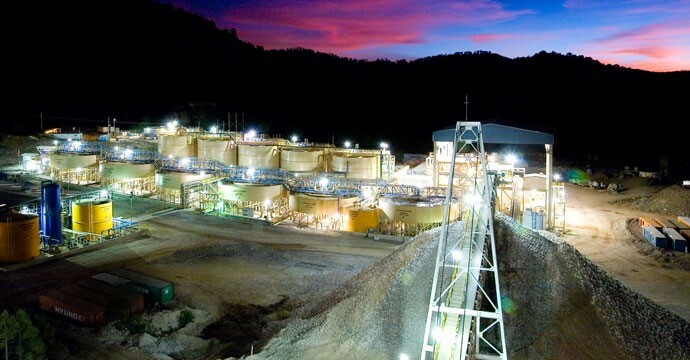 · - Prior to the issue of a decision on the authorization of a program, an opinion must be requested from the Local Tax Administration of the SHCP corresponding to the company, to verify that the company is up to date with its tax obligations and whether it is subject to administrative enforcement proceedings for any tax credit. 4. When the goods imported under the Decree have been assigned to purposes other than those established in Article 4 therein, without have been subjected to the disposition in the following article. The holder of the Prosec program shall inform the Secretariat of Economy of the foreign trade operations performed during the previous year under the program. When the company fails to submit the report mentioned in the previous paragraph within the set period, its program will temporarily lose validity and the company will not be able to enjoy its benefits unless the omission is remedied. In the event that on the last working day of June the company has not filed the said report, the program will lose validity permanently. Filing this report does not release producers from the obligation to use the stock control computer system registered in accounting, which meets the requirements established by the Secretariat of Finance and Public Credit. For more information about this program, call 01 800 410 2000 throughout the country or write to the Secretariat of Economy at http://www.gob.mx/se/; or call, Sergio Manríquez Fernández, Subdirector of Tax Refunds on 52-29-61-00, ext. 34347. 1. Decree which Establishes Different Sectoral Promotion Programs. 2. Customs Law and its Regulations. 3. Federal Law of Administrative Procedure. 4. Foreign Trade Law and its Regulations. 5. Internal Regulations of the Secretariat of Economy. 6. Agreement by which the Secretariat of Economy issues General Rules and Criteria on Foreign Trade Matters, and their amendments. 7. General Rules on Foreign Trade Matters. The procedures related to this program should be filed from 9:00 to 14:00 in the public service windows of the delegations and subdelegations of the Secretariat, according to the address of the plant where the production process is performed. Should the company have several plants, it shall be filed in the office of its choice, providing it corresponds to one of its plants. Any subsequent procedure must be carried out with the office where the application was filed. The application for a new program must be completed using PROSEC.EXE and be filed on magnetic disc and accompanied by a printed original and copy. The program can be obtained on this page or directly from the public service windows, presenting four, high density 3.5" magnetic discs onto which the program will be downloaded. The application should be signed by the legal representative of the company and accompanied by the corresponding complementary documentation. Companies with Sole Register of Accredited Persons (RUPA) should not fill out the following information: company or business name, address, telephone, fax, corporate purpose or main activity and name of the legal representative; nor should the following documents be submitted: articles of incorporation and amendments and the power of attorney of the legal representative. The original documents or certified copies requested shall be returned at the time the application is filed, after comparison with the simple copy. 1. Articles of Incorporation and related Power of Attorney; or show copy of the Sole Register of Accredited Persons (RUPA) or indicate at the time of filing the Tax Identification Number of the person registered. 2. Tax Identification Card (copy). NOTE: Only applications which submit the PROSEC.EXE program will be accepted. Submit a free-form letter accompanied by the corresponding annexes which should be completed using the PROSEC.EXE program, submitted on magnetic disc with a printed original and copy. The application should be signed by the company's legal representative. Corresponding power of attorney; or show copy of the Sole Register of Accredited Persons (RUPA) or indicate at the time of filing the Tax Identification Number of the person registered. NOTE: When completing the new program or extension application, only the sector should be indicated. For a change of company or business name, submit a free-form letter accompanied by the amendment or change of company name duly notarized and registered in the corresponding Public Registry of Property and Commerce, along with a copy of the new tax identification card. For a change of registered address or plant address(es), submit a free-form letter indicating the new address including the street number (inside or outside, as is the case), neighborhood, postal code, city, municipality, state, telephone and fax. To apply for the cancellation of a program, a free-form letter must be filed signed by the company's legal representative indicating the reasons for the request. 1. For new programs and extensions, go to the aforementioned windows to obtain the PROSEC.EXE program. 2. For amendments and cancellations submit a free-form letter. 3. Fill out the said application form and accompany it with the corresponding annexes and complementary documentation. 4. For new programs and extensions, submit at the window the disc and the printed original and copy of the application and copies of the documents corresponding to the procedure requested. 5. One copy of the application will be stamped and numbered and will serve as proof to collect the authorization or denial which will be issued within a period of 20 working days for new programs and 15 working days for other procedures. If the application is not properly completed or lacks some documentation, the Secretariat of Economy will issue and deliver to the interested party the resolution establishing the information required in order to pursue the application, and which shall be issued within a period not exceeding one third of those mentioned above. NOTE: The application for extension can also be filed through the Internet page: http://www.economia.gob.mx/?P=55. The creation of sectoral promotion programs reflects the need to raise the competitiveness of national production in international markets, to promote openness and trade competitiveness abroad with fundamental elements of a dynamic, progressive economy and establish instruments to encourage the integration of efficient production chains. In recent years the Mexican manufacturing sector has become an important part of the economic globalization process enabling it to position as the eighth largest exporter in the world. Furthermore, the NAFTA contemplates beginning in its eighth year, the modification of temporary importation mechanisms in effect in the member countries, for the purpose of avoiding the distortion of the preferential tariffs agreed upon in NAFTA. For this reason, beginning January 1, 2001, the tariff treatment by Mexico to non-North America originating raw materials and machinery, used for the production of goods for export to a NAFTA country must be homogenized with the said treaty. Also, that the supply of non-North American inputs and machinery is critical for certain industries and that these require competitive tariff conditions for their supply. In light of the above, the Federal Government decided to establish competitive conditions for the supply of inputs and machinery for the export industry and encourage greater national integration of inputs. The Siicex web site is intended to offer organizations, businesses, importers, exporters, government, students and citizens, information related to foreign trade from a single enquiry point, enabling them to reduce transaction costs by facilitating information searches and providing certainty about their obligations in acts of Foreign Trade. Its purpose is to present the regulations which establish the general provisions within the scope of competence of the Secretariat, and the criteria for compliance with laws, international trade agreements or treaties, decrees, regulations and other regulatory systems, grouping them, so users can apply them easily. The system comprises five sections: Siiceteca (Virtual Library); Tariff; Foreign Trade Bulletin, Today; Did you know…? and This Month, which together seek to give users easy access to information related to foreign trade. The Tariff Information System via Internet contains up to date trade statistics, with monthly trade data from 2007. It is a virtual library containing information on legal instruments pertaining to foreign trade in different versions (original text, amendments and integrated text), and related publications, and the procedures and forms which apply for each system. The virtual library is made up of six modules: Laws and Regulations; Trade Treaties and Agreements; Decrees; Quotas; Permits and Miscellaneous Regulations, and Foreign Trade Rules. 1. Laws and Regulations. This module gives access to the different laws and regulations governing foreign trade such as the Foreign Trade Law; the Customs Law; the General Import and Export Tax Law, etc. 2. Trade Treaties and Agreements. This module shows the various decrees on free trade treaties signed by Mexico, which are: North America (USA/Canada), Costa Rica, G2 (Colombia), Nicaragua, Chile, European Union, Israel, Northern Triangle (El Salvador/Guatemala/Honduras), European Association (Norway/Iceland/Liechtenstein/Switzerland), Uruguay and Japan; and also the Decrees on Economic Complementation Agreements signed by Mexico such as the ECA 6 (Argentina), ECA 8 (Peru), ECA 51 (Cuba), ECA 53 (Brazil), ECA 54 and 55 (Argentina, Brazil, Paraguay and Uruguay). The module also shows the tariffs (decrees concerning applicable rates), customs rulings and mentions the partial scope agreements, which are: Ecuador, Paraguay and Panama. 3. Decrees. The module is made up of the various decrees regarding development programs such as IMMEX, PROSEC, ECEX, ALTEX and Drawback published in the Official Gazette of the Federation, as well as TIGIE Tariffs, FTA and Border Tariff Rates, Competitiveness of the Automotive Industry, Vehicle Importation and Border Vehicles (businesses and residents). 4. Quotas: This module includes the quota agreements derived from trade treaties and agreements (FTAs, ECAs, ALADI, WTO) and unilateral agreements. The module is divided into three parts: America: (North America (US/Canada), Colombia, Costa Rica, Nicaragua, Northern Triangle (El Salvador/Guatemala/Honduras), Uruguay, ALADI, ECA 53 (Brazil), ECA 55 (Mercosur), ECA 6 (Argentina) and remaining quotas; Europe and Asia: European Union, European Association (Norway/Iceland/Liechtenstein/Switzerland), Israel and Japan, and Others: (WTO, Unilateral and Federal Income Law (Tenth Transitory Provisions)). 5. Permits and Miscellaneous Regulations: This module includes the SE's agreements on non-tariff regulations such as: TIGIE 2002-2007 Miscellaneous Provisions and Correlation Tables, Permits, Official Mexican Standards (NOMs), Countervailing Duties, IMMEX (PITEX/Maquila), Automotive, National Content and Regulatory Quality as well as those of other agencies: Commission for the Control of the Production and Use of Pesticides, Fertilizers, and Toxic Substances (Cicoplafest), and the Secretariats of Agriculture, Livestock, Rural Development, Fisheries and Food (SAGARPA), National Defense (SEDENA), Environment and Natural Resources (SEMARNAT), Energy (SENER), Education (SEP), and Health (SSA). 6. Foreign Trade Rules. This module includes the amendments and annexes of the General Rules and Criteria on Foreign Trade, issued by the Secretariat of Economy, and also includes the General Rules on Foreign Trade of the SAT, issued by the Tax Administration Service (SAT). This section is the result of a joint effort by the Secretariat of Economy and the Mexican Confederation of Associations of Customs Brokers (CAAAREM), to streamline the activities of the different stakeholders in foreign trade. The section provides information on the current tariff rates of the General Import and Export Tax, including FTA and Prosec tariffs, of non-tariff regulations and general observations. This electronic bulletin represents the efforts of the Secretariat of Economy to diffuse, periodically, topics of interest and relevant news on foreign trade, such as Official Provisions (amendments and publications of decrees, agreements, rulings, etc.). Presents current issues, statistics, brief and relevant news, tips on foreign trade and frequently asked questions on topics such as Trade Facilitation, Program Transparency and Foreign Trade Instruments. 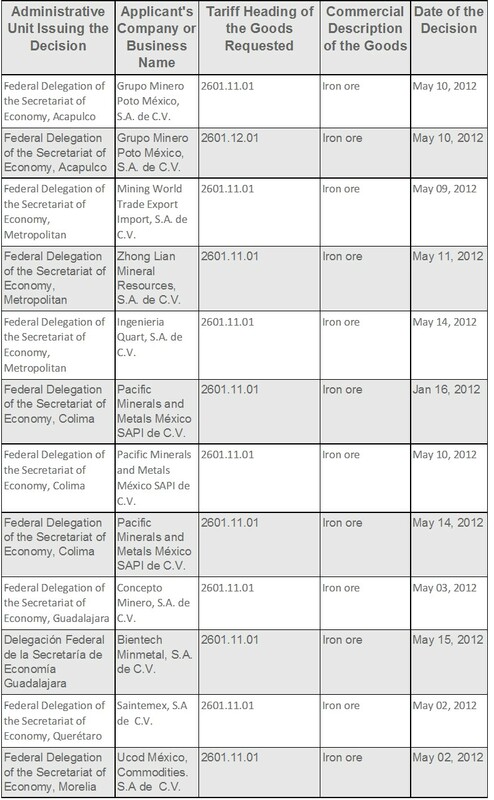 Contains a set of official provisions on foreign trade which are published in the Official Gazette of the Federation (DOF) by the agencies and entities of the Federal Public Administration during a calendar month, such as: agreements, rulings, manuals, annexes, decrees, clarifications, decisions, rules and notices. The Director General for Foreign Trade is responsible for the information published on SIICEX. Rule 4.1 of Title 4 of the Agreement through which the Secretariat of Economy issues the General Rules and Criteria on Foreign Trade, dated July 6th, 2007.